We often talk about how many cars, houses, and other things we would buy with a million dollars. We even dream about never working again and just living off that money with a drink in our hands on the beach. But can you really live off the interest on a million dollars? In a previous article, we found that the largest interest return you could currently get would be around $23,000 a year. There are however other places you could invest your money that would provide more income. For instance, you could invest in real estate or the stock market. Both would generate income that you could live off of. Even investing in the Vanguard high dividend fund will provide you with over $30,000 in income per year. Real estate is more difficult to figure out a percentage, however Paula Pant from Afford Anything says you should find a property that the rent is 1% of the cost of the building. So for a $100,000 house, you would get $1,000 monthly ($24,000 annually) in income. If you invest that million that would generate $240,000 a year of income. Again these are not interest, but ways to invest your money in producing more money. A study called the Trinity Study basically says that you can safely withdraw 4% of your investments every year and as long as you have 25 times your annual expenses saved you will never run out of money. This is based off on average the stock market has done 7%% to 10%, there are some years where the stock market lost money, and years where it has made much more. But if you take the average and then spend less then that, you should, in theory, be able to live off that income forever. 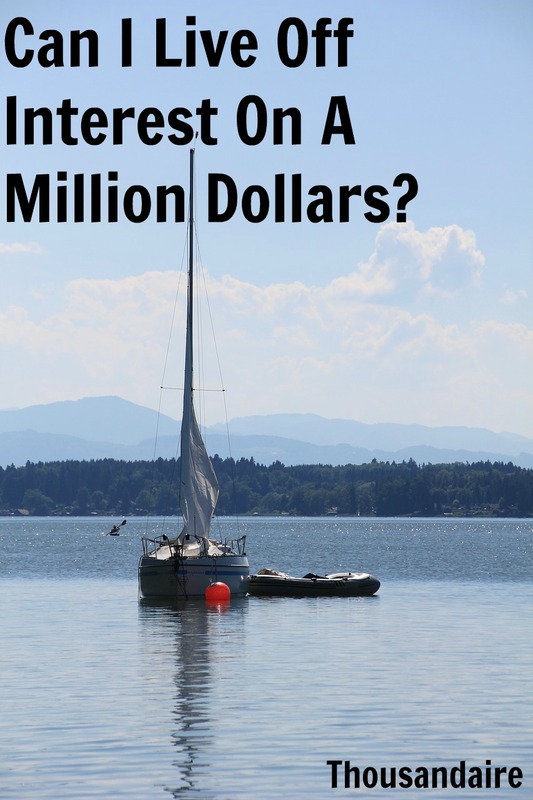 Can I Live Off Interest On A Million Dollars? The average household income in the United States is around $57,000 a year. Some reading this make considerably less and think that’s a lot of money. Others read that amount and have no idea how you could live on so little. But can you survive with the interest that comes from a million dollars? The answer is most people couldn’t, with the maximum amount of interest you could receive of $23,000 through a CD. That’s well below the average income, as well as the poverty line for a family of 4. That doesn’t mean you can’t live off that money, Jason Fieber lives off much less, but he is the exception rather than the rule. If you invest in dividend funds, real estate, or the total stock market, you can receive much more income that will also go up year after year. If you can live off $23,000 and you have a million dollars in the bank, you’re done congratulations. If not then it’s a nice start towards your retirement. You could use that money to invest in the stock market, real estate, or even start your own business. Whatever you do enjoy your life and don’t let money be the reason you don’t. By Tyler Philbrook|June 19th, 2017|Categories: Blog|Comments Off on Can I Live off the Interest on $1 Million?